On November 17, 2015, the Greensboro Historical Museum honored William B. “Bill” Moss, leader behind the Carolina Field of Honor at Triad Park, a place that recognizes local veterans from World War I to the present. 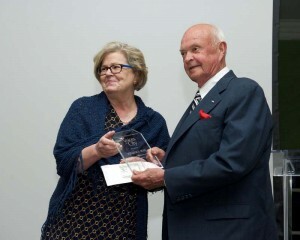 Moss received the 2015 Voices of a City Local History Award, bestowed on individuals and organizations who have made significant contributions to local history, at the museum’s annual membership dinner. Carolina Field of Honor, which has already welcomed tens of thousands of visitors, opened at Triad Park in 2014. For more information, visit www.ncwmf.org. Museum members gave Bill Moss a standing ovation as he received the 2015 Voices of a City Award for his leadership role in developing the Carolina Field of Honor at Triad Park.